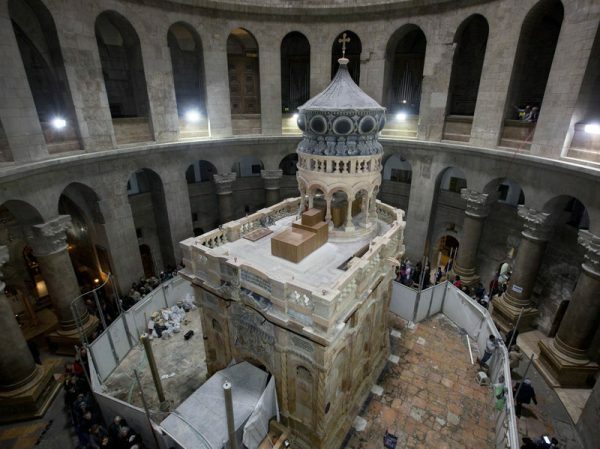 JERUSALEM: A team of scientists and restorers has completed work on the site of the tomb of Jesus in Jerusalem's Old City, and it will be re-opened to the public on Wednesday. The group has worked for the past nine months at the Church of the Holy Sepulchre and focused on the small structure above the burial place, known as the Edicule. According to Christian belief, Jesus’s body was buried at what became the site of the Church of the Holy Sepulchre. The restorers have also repaired other parts of the church, the project’s supervisor said. The structure needed reinforcement and conservation, including installation of an underground drainage network for rainwater and sewage, Antonia Moropoulou, a professor at the National Technical University of Athens, said on Monday. Moropoulou directed the work at the site. The Greek Orthodox, Armenian and Roman Catholic denominations share custody of the church, where tensions often run high over control of its various sectors. Disputes between the dominations have held up restoration work for more than 200 years. Each denomination has contributed US$3.3 million for the project and Jordan’s King Abdullah also made a personal donation, media reports said. Moropoulou said extensive work had been carried out on the masonry of the tomb, and titanium bolts were inserted into the stone slabs, including the one covering Jesus’s tomb.